We’d love your help. Let us know what’s wrong with this preview of Grounded in God by Suzanne G. Farnham. This powerful, prayerful, and practical guide teaches groups a whole new way of conducting meetings and reaching consensus. Whether your group, committee or board is secular or religious, its members can now move beyond parliamentary procedure to a higher level using the model described here. Rooted in scripture, Grounded in God energizes and inspires. Learn how to incorpor This powerful, prayerful, and practical guide teaches groups a whole new way of conducting meetings and reaching consensus. Whether your group, committee or board is secular or religious, its members can now move beyond parliamentary procedure to a higher level using the model described here. Rooted in scripture, Grounded in God energizes and inspires. Learn how to incorporate creative silence, imagination, intuition, attentive listening, scripture, and prayer into routine meetings, decision making, or working retreats. By opening up to new perspectives, discover that the first order of business is to become attuned to God's presence within those assembled. 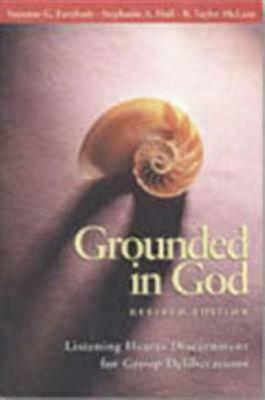 To ask other readers questions about Grounded in God, please sign up. "The church is the body of Christ in the world today; as such, God has much to accomplish in and through us as we live and work together." I searched high and low through my books on this site, looking for my review of this title. I read this book last year and it had a major impact on my life. So how could I forget to review it? Farnham has given all Christians, no matter what denomination, a way to make sure God is in the midst of all decisions. This is not really how most churches work, at leas "The church is the body of Christ in the world today; as such, God has much to accomplish in and through us as we live and work together." Farnham has given all Christians, no matter what denomination, a way to make sure God is in the midst of all decisions. This is not really how most churches work, at least in my experience. We tend to look at our decisions as if they are ones that we would make in the non-religious, work-a-day world. It is easier to use the skills we have honed at work and at home. However, Jesus said that we are to pray that God's will be done on earth. So therefore, we should make sure that we listen for God's voice. The exercises in Farnham's book take time, trust and faith. It is not easy to try something new when people are anxious. And I believe that many Christians are anxious. I am about to be on a discernment committee at church and this is required reading. The second book of required reading for my participation in my church's discernment committee for a potential ordinand. I thought the Scripture passages used to introduce and conclude each chapter were particularly well chosen for their applicability. This is just a little gem on the art of communal discernment.